There are a handful of non-fiction books I come back to again and again. These are sorts of books that each time you go back to them, you find something new, and seminal. They express ideas that were influential later on, and were first expressed there in that particular way. When talking about cities and urban planning, favorites are books like Jane Jacobs’ Death and Life of Great American Cities, Christopher Alexander’s A Pattern Language, Michael Porter’s Competitive Advantage of Nations, Lee Kuan Yew’s From Third World to First and Chester Liebs’ From Main Street to Miracle Mile. Each of these books, mostly about cities and economics, speaks about how to improve the human condition, or observes something important and special about where we are today, and where we need to go. 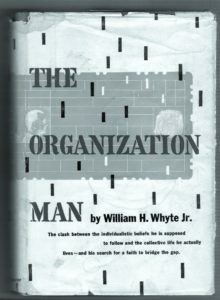 One book that seems to be resonating with me today is William H. Whyte Jr.’s The Organization Man. Whyte, a sociologist and urban theorist who wrote books and articles about the way cities work, wrote The Organization Man in 1956, at the height of the 1950s expansion of the U.S. in the Eisenhower era. Interestingly, the book came out in 1956, the same year of Sloan Wilson’s famed critique of corporatism, the novel Man in the Gray Flannel Suit. What Princeton-educated Whyte describes so perfectly is the advent of a post World War II culture that was completely alien to the American way of life as it had been known up to then. Whyte, who was called Holly, noticed that our American individualism was in the process of being destroyed. He saw it decades before many others, and put it in the context of something larger than the liberal/conservative or capitalist/socialist argument that was going on then, and continues to rage now.